Despite the need for the occasional amendment, the U.S. Constitution has served us well, generally speaking, for 221 years. However, the Constitution is now preventing the newly elected U.S. leadership, specifically, the President-Elect, from acting swiftly and boldly to help remedy today's unrelenting and accelerating economic crisis. The reason? 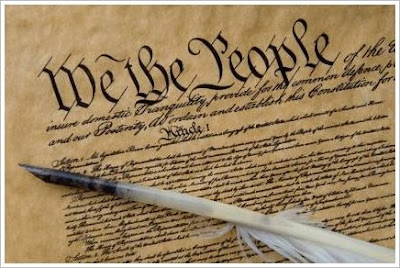 The Constitution provides for a temporal transfer of power. It is based on a time schedule, as opposed to a Parliamentary system, which is more based on levels of power. The Parliamentary system provides for a vote and power is transferred, immediately. Under a Parliamentary system, Americans would have had the opportunity to throw out the Bush administration long ago. Barack Obama would have been able to take power and get his team to work on the dire financial issues of the day, ASAP. Power. Time Schedule. Power. Time Schedule. Of course, the INKSPOT•PROJECT is not advocating a new system or even a Parliamentary system. We're simply illustrating the point that the U.S. Constitution, with all its wisdom and brilliance, is failing all of us, by not providing for immediate leadership change. In the midst of the greatest economic crisis since the Great Depression, Americans' confidence and trust in government is deeply sagging. New leadership energy is desperately needed in the United States, right now. Candidate Obama liked to say, "We can't wait." The Constitution says we must. The current administration is squarely in the way of new ideas and solutions. Bush, Paulson and Bernanke continue to bungle their way through this meltdown and nothing of significance will be done before they get out of the way. A monstrosity of a "lame duck" is now caught in the gears of progress and has effectively ground them to a halt, preventing the solutions from getting to the problems. Even if the current administration were competent and capable, the constitutional transfer-of-power-time-schedule would still make it difficult, if not impossible, to implement new helpful policies. The Constitution needs a new amendment. One that provides for a significantly shortened "lame duck" term and a much quicker transition to power should be considered.